An example of “Kakemono” Japanese Wall Art. The Education Department at the California Center for the Arts, Escondido is hosting another free 2nd Saturday art lesson on Saturday, February 9, 10 a.m.-12:15 p.m. in the Education Studio 2. February’s free art lesson will feature “Kakemono” Japanese Wall Art. A kakemono (“hanging thing”,) is a Japanese scroll painting which can include calligraphy. These paintings were hung in close relationship to the architectural setting in which it was hung, most notably for Japanese tea ceremonies and Buddhist temples. 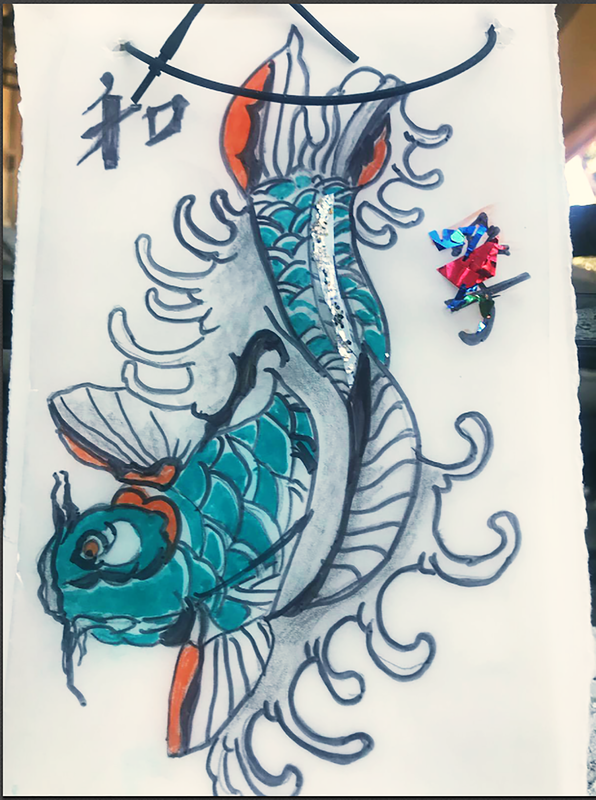 A great variety of painting and calligraphy is mounted in this art form, and in this lesson, you will have the option of creating a koi fish or cherry blossom kakemono, with the opportunity to add Japanese calligraphy and embellishment. Taught by Center Teaching Artist, Nancy Robinson, 2nd Saturdays art lessons are one hour, free classes held in Studio 2. This is a non-ticketed event with space available on a first come, first served basis. Early arrival is recommended. All materials are provided, just bring your creativity! After the lesson, visit the museum exhibition, Manzanar: The Wartime Photographs of Ansel Adams & Wendy Maruyama: Executive Order 9066 with free admission! Escondido’s 2nd Saturday Arts & Culture Experiences is a uniquely creative collaboration between Escondido arts organizations, with the goal of injecting art and culture back into the community.